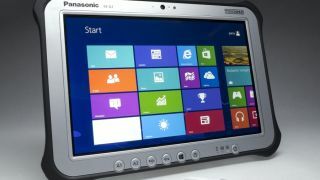 Panasonic has added 10.1-inch Windows 8 Pro and 7-inch Android devices to its Toughpad range of rugged business tablets. The Windows 8 Pro version, named Toughpad FZ-G1, is the company's first rugged device made for the new operating system and is designed for mobile workers who spend much of their time on the road. It weighs 1.1kg and has two-way touch input with a capacitative 10 finger touchscreen and digitiser pen. It is the company's first fully rugged device to use IPSα Panel technology, and includes strengthened glass, extra wide viewing angles, a high contrast ratio and 800cd/m2 high brightness paired with an anti-reflection layer. Its full HD screen is built to perform in any light conditions. The device G1 will have a MIL-STD-810G rating for 120cm drops and an IP65 ingress protection rating for resistance to dust and water. It will also be rated for use in extreme temperatures. Other features include a front web camera and optional rear camera, customisable application keys, flexible configuration ports and an optional dual external antenna connector. It is powered by third generation Intel Core i5-3437U vProTM 3MB cache, 1.9GHz, up to 2.9GHz with Intel Turbo Boost Technology and comes with 4GB of RAM and 128GB SSD as standard and a 256GB SSD option. The JT-B1 Android model is designed for one handed use, weighing just 544g and offering four finger touch, a high visibility and low reflection display and an ambient light sensor. It has a dimpled, concave surface to aid one-handed grip and a back-fitted hand strap. There are three customisable one-click keys, allowing users to jump straight to the apps they need with a short or long click. The device is also equipped with a 1.3MP front web camera and a 13MP back camera with autofocus and LED light for detailed documentation and image capture. It has a MIL-STD-810G rating for 150cm drops and an IP65 ingress protection rating for resistance to dust and water. Other features include connections for Bluetooth, 3G, wireless LAD and near field communications, a Texas Instruments Ti OMAP 4460 1.5GHz Dual Core ARM processor, 1GB of RAM, 16GB Flash storage, and an open interface for developers to design specialist accessories. These could include barcode readers, payment devices or smartcard readers.